Talking and Listening. Harbor Hall. 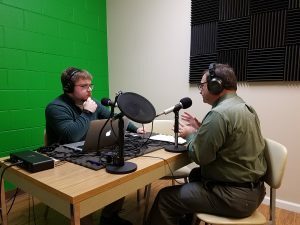 Recently, the CEO of Harbor Hall, Pat McGinn had an opportunity to record a podcast with the News-Review Podcast. So much more can be conveyed about our organization through the spoken word to an active listener. We are grateful for the chance to tell our story and share our mission. A big thanks to Matt Mikus who facilitated this for us, and for asking some really great questions about our organization. Photo: Harbor Hall CEO, Pat McGinn (right) during a recent recording of a podcast with Matt Mikus (left) from the News-Review.